Frida Kahlo had a major thing for her own face. Self-Portrait with Monkey and Parrot is just one of 55 self-portraits Frida Kahlo made over her lifetime, most of which feature a ton of flora, fauna, and facial hair. Roots, leaves, and rustic patterns all contribute to her image of native Mexico. Some say the monkey and parrot refer to the Aztec symbols for lust and promiscuity. They’re also totally Kahlo’s pets, Fulang-Chang and Bonito. “La Casa Azul”, or the Kahlo-Rivera residence, hosted a bunch of animal friends who make symbolic cameos. Fulang-Chang and Bonito shared a backyard pyramid house with Granizo the fawn and Gertrudis Caca Blanca the eagle, and Bonito could do tricks for peanut butter, so I guess it’s not actually hard to imagine why Kahlo didn’t leave the house much. 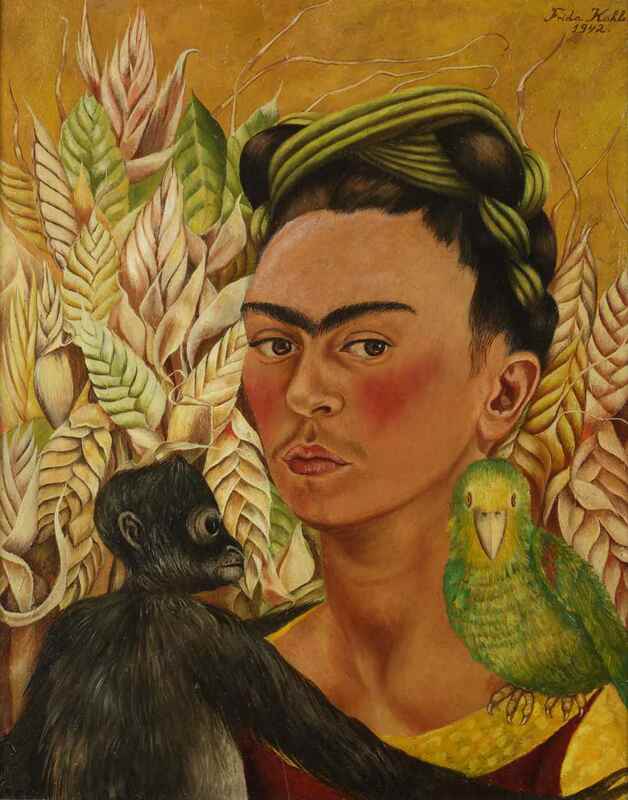 Despite the tight crop, Self-Portrait with Monkey and Parrot also shows that Kahlo was a total style icon. She tied her hair in accessorized braids to celebrate her Mexican heritage, and wore brightly-colored traditional woven textiles. She also purposefully thickened that epic facial hair as a kind of feminist jab at gender norms. As a biracial, bisexual female artist, Kahlo cared about expressing her own complex identity within the context of nationalist Mexico. A lot of her art thematizes combining two entities to make a new one - cultures, sexualities, eyebrows, what have you. Most of Kahlo’s self-portraits relate to pain or suffering in some capacity. They were primarily made as coping mechanisms for the two great accidents of her life: being hit by a bus, and marrying Diego Rivera (“Diego was by far the worst”). Yet hanging out in some corn with Fulang-Chang and Bonito doesn’t seem particularly traumatic. Kahlo’s moods can be tough to read in her paintings, since she always frowned to hide an unfortunate teeth situation, but the bright colors and neutral content here probably reflect a relatively happy time in her life. It’s 1942, her works are shown in some major galleries, and things are generally going swimmingly at La Casa Azul. Although she didn’t sell many, the self-portraits started popping up in museums in both Mexico and the United States. She also presented one as a birthday gift to Communist leader (and at one point, lover) Leon Trotsky, because nothing says “Happy birthday!” like a painting of your own face. Now, La Casa Azul serves as the Frida Kahlo Museum in Mexico City, and a large collection of works like Self-Portrait With Monkey and Parrot are still there. And yes. Fulang-Chang’s pyramid house is still there too. Bradley, Laura. “Frida Kahlo's Monkeys, Dogs & Birds.” AnOther, 13 Oct. 2011. www.anothermag.com/design-living/1467/frida-kahlos-monkeys-dogs-birds.